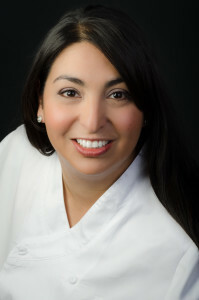 Natasha Gandhi-Rue is the chef and co-owner (along with her husband Scott) of The Kitchen, an American Bistro restaurant located in the heart of downtown Wichita – Union Station. Chef Natasha is responsible for the daily operations of The Kitchen as well as menu creation, culinary execution and standards. She leads her team in all aspects of running a local restaurant. A leader in culinary education, Natasha offers cooking classes at The Kitchen. Chef Natasha is a formally trained chef from the renowned International Culinary Center (formerly French Culinary Institute) in New York City. Along with her Culinary degree she has a double major from The Pennsylvania State University. Prior to opening The Kitchen, Natasha spent 15 years as the International Culinary Chef Manager for Williams-Sonoma, Inc.. Her responsibilities included the development and management of culinary programs in all stores worldwide. Originally from New Jersey, Chef Natasha is admittedly a “city girl”, but for the last 18 years, she has been living, cooking and teaching in Wichita, Kansas and happily calls it home. Her newest adventure as chef and owner of The Kitchen allows her to serve her hometown delicious food as well as continue her passion for teaching culinary arts to food lovers.